If you are having a tough day, take a pause and notice your breath. Do you feel yourself breathing? Our breathing reverberates in our body and this vibration is directly related to the vibrations in our mind that come as thoughts. As ancient yogic texts have explained, our thoughts affect our breath. Our breath affects our body function. Our body function/health affects our speech. Our speech affects our actions. And our actions affect our destiny. Therefore, if you want to make a change in your life, invite a positive change to your breathing pattern. Notice the next time that you are feeling angry or stressed about something. Excited thoughts lead to an excited breath, which can lead to quick, reactive decisions; some that we later regret. Sad thoughts lead to a dull, heavy breathing pattern that can make it hard to take any action to help ourselves. Positive, happy thoughts are connected with effortless deep breathing throughout the body. This leads to positive actions and choices that can make our life better. The pattern of breath and thoughts which vibrate within you will ripple out into the functioning of your organs and determine what words are spoken, what actions are taken, and the energy attracted. 1. When you need to quickly re-set – Breathe through the nose to allow the breath to slow down. This also helps you get more air into the lungs, and helps you clean more old air out of the lungs. If you pause and take some really deep breaths, moving the air deep into your body, you will immediately start to feel differently. 2. When you are feeling angry or stressed – Pause and fold forward at the hips, letting your torso hang down towards the floor. If you feel tightness in the lower back and hamstrings, bend your knees a bit so that your hips rotate over the legs. Now, lengthen your inhale and let your exhale last as long. See if you can stay here up to one minute. Then, slowly roll up to standing. And notice how the world looks. 3. When you are feeling low in energy or emotion – Stand up, feet hip-width apart. As you inhale, take your arms up to the sky. As you exhale, take the arms out and down by your side. Do this about 10 times, and begin to connect the breath with the movement of the arms. See if you can even go slower with the arms and breath. On the last round, keep the arms up in the air for 10 smooth breaths through the nose. And then gradually lower them down. 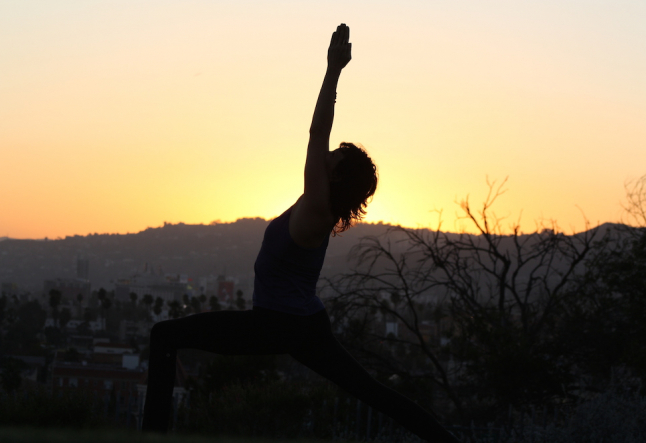 Take a Yoga Class – Yoga is more than just exercise for the body. Many forms of exercise focus on exhaling, pushing and forcing the heart rate to rise. Yoga balances that with time to inhale lots of good, fresh air into the body. The more fresh air we put into our system, the more efficient our body operates. Digestion, assimilation and elimination improve. When our bodies are working well, it’s easier to have positive thoughts and take positive actions. Practice Pranayama – If you are really interested in improving your breathing, consider taking a Pranayama Class at a yoga studio. Pranayama is the technique of expanding one’s life force (the energy behind the breath) through breathing techniques. Many Pranayma classes inlude a few poses to open the body and end in a meditation. If you don’t like what’s going on in your life, before you decide to take a radical action, start simple. Expand your breathing to bring more positive energy into your system. This will ripple from your mind to your breath and out into your life.